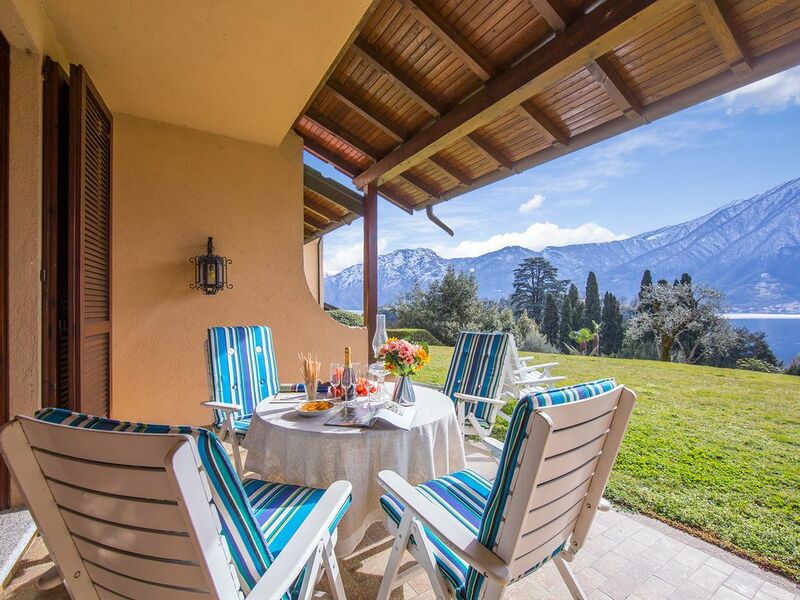 Just a two-minute walk from the heart of the village, Comacina Island Residencerises in a sunny and dominant position; it boasts a sensational view of the Lake, on the Comacina Island and on the picturesque village of Sala Comacina. The house, which can comfortably accommodate until seven people, is equipped with electrical fans, TV with DVD player, possibility of Wi-Fi connection (upon request for an individual cost). It is developed on three levels, in a residential context of terraced houses; it is equipped with private fencing and electrical gate, which make this location exclusive and safe. On the ground floor, the living area offers an inviting sitting room and a corner fireplace, a contemporary crystal table and big French doors that lead directly into the Lakeview patio, making this area very familiar and captivating. On the same floor, but separate, there is the kitchen with granite worktop, equipped with all the devices, like: induction cooktop, oven, microwave, toaster, kettle, coffeemaker and dishwasher. A big rectangular table makes it suitable even for large families. The terrace offers the chance to relax, or even to organise barbeques with the family, enjoying the beauty of the view, of the shared garden but most of all the spectacular view of the fascinating Comacina Island. On the first floor, in the sleeping area, you will find a big romantic double bedroom with balcony, where you can enjoy the view on the village, the Lake and the Island. The single bedroom instead is equipped with a comfortable wardrobe and facing the view of the garden. On the same floor there is the main bathroom with bathtub and a large window. A wonderful and comfortable loft on the attic is illuminated by two big skylights with view on the Lake and on the mountain, which make this space very ventilated, also thanks to the height of the ceiling. The welcoming wall covering in wood is suitable for the guests who want to enjoy a vacation with a friendly and family spirit. Two single beds on one side and a double bed on the other side, with large wardrobes, complete this context. Always on the same floor, you will find a bathroom with shower and washing machine, essential for the comfort of the vacation. A private garage is also at the guest’s disposal. To the guests who will want to pass their vacations in Sala Comacina, are advised the authentic Trattoria Cheghel and the Lido of Sala, like the Locanda di Trilindana, on the lake bank, which is the perfect place for the most refined palates with its sophisticated cuisine. The stay in Sala Comacina is not complete without a boat trip to the Island and a dinner at the “Locandadell’Isola Comacina”. It is also indispensable to pay a visit to the wondrous Villa D’Este in Cernobbio, which attracts tourists from all over the world. The idyllic environment of the historic Sala Comacina places our guests only a few steps away from the Greenway passage of the Lago, from the Lido, from the tennis courts, from the boat rental services of the close Ossuccio, from the supermarkets, from the beach and from Villa Balbianello, picturesque attraction in Lenno (5 minutes drive), from the picturesque tourist village of Menaggio. Bars, restaurants, connections with ferryboats, lidos and Villa Carlotta can be found on the Tremezzinabank, only 10 minutes away by car. The most active guests can also enjoy the tracks on the nearby Sacro Monte of Ossuccio and San Martino inGriante, or live a carefree moment on the Lake sailing or practising water sports, like kayak or water ski. The west bank is also perfect for a bike ride, a horse ride, or a golf game at the prestigious Menaggio&Cadenabbia Golf Club (20 minutes drive). The extreme sports enthusiastic instead, have at their fingertips paraglider,quad-bike, rock or tree-top climbing and the opportunity to ski on the Italian Alps.